I’ll be honest. The closest I’ve ever come to surfing was watching those 1972 episodes of “The Brady Bunch” when the Brady family traveled to Hawaii, found a cursed tiki, and Greg, while wearing said tiki, suffered a surfing accident. They made a cliff-hanger out of the incident and we had to wait a WHOLE WEEK to see if Greg pulled through. I remember being worried for fictional Greg. Ahhhh, to be 13. 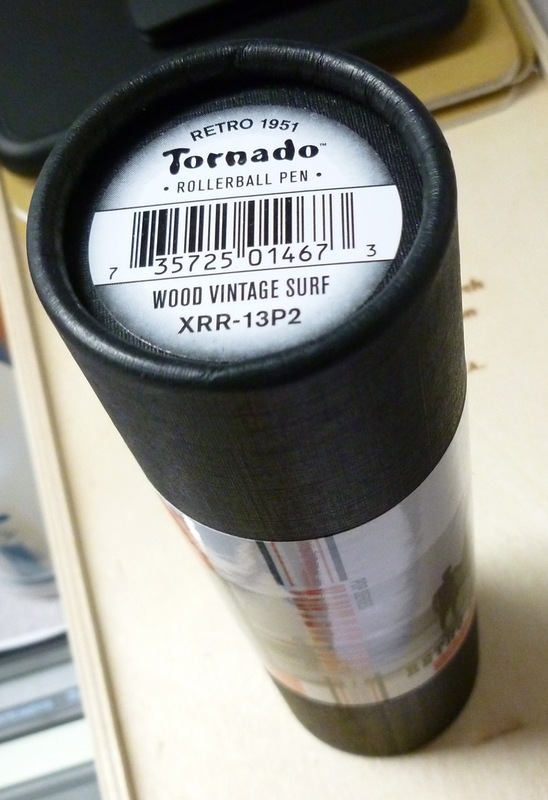 Despite my lack of surfing prowess, when I saw Retro 51’s latest Popper release- The Vintage Surf Tornado– I had to have one. I loved the look of the wooden barrel and surfboard-esque, oh-so slightly distressed, stripes. Couple those handsome looks with a limited edition of 500 pens and you’ve reeled me in. Well played, Retro 51, well played. I purchased my pen from Art Brown (list price $55, Art Brown price $44 + S/H) because I just wasn’t finding it available anywhere else and I didn’t want to risk a sell-out. Brad Dowdy scored a MAJOR win by obtaining one from Amazon for a mere $20, which is a STEAL…but I hear that that source has since dried up. Though I would’ve loved to pay only $20, I don’t feel gypped at the price I paid. The pen is THAT nice. And lets’ not forget…limited edition, so a bit of a premium charge doesn’t seem unreasonable. Retro 51 has recently introduced new packaging that is touted as being more environmentally friendly, but I’ll be honest, I miss the vibrant metal tube packaging. Pulling the top off of those tubes made a satisfying “pop” sound and with the stunning colors and text, the tubes looked as collectible as the pens. The new design is paper-based, so there’s no more “pop,” and the look is a bit more subdued. Inside the new tube is a foam insert that holds the pen in an upright position, and I do like this feature (vs. the pen sleeve). The graphics are a bit more retro than in the past, and are admittedly pretty cool, but I still miss the metal. I will, though, adjust. Oh, this pen! It’s slightly heavier and thicker than a regular Tornado, well-balanced, and very smooth…both in the feel of the wooden barrel and in the writing experience. I swapped in an 8126P refill (Private Reserve or Schmidt) for the included one (8127P) as I enjoy the finer line of the 8126P (0.6 mm as opposed to 0.7 mm). 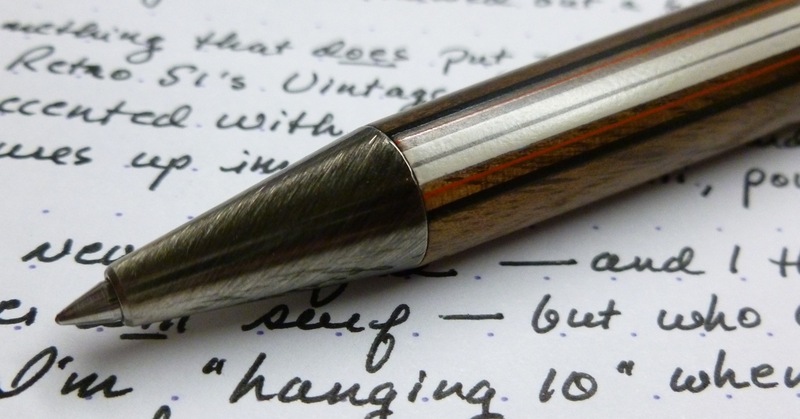 The writing tip is easily extended by twisting the knurled end of the pen. 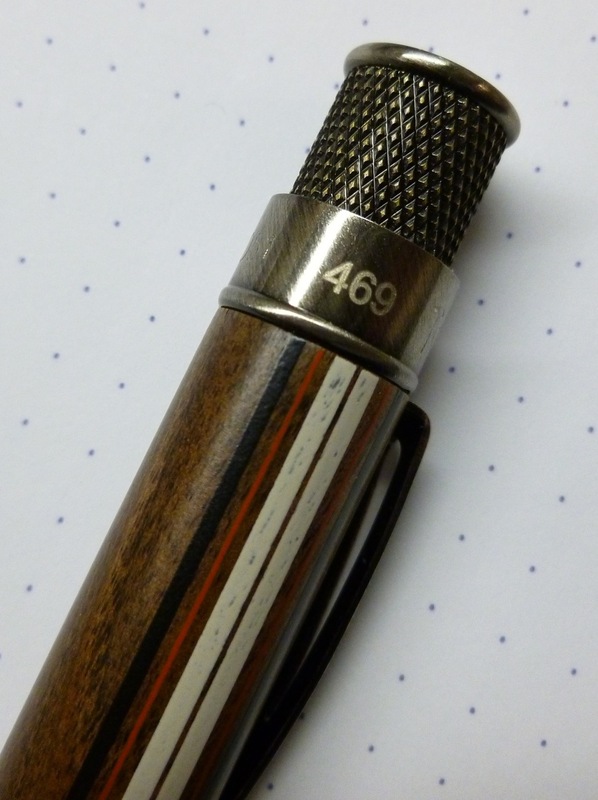 The gun-metal-ish finish on the clip, front section, and knurled end compliments the wood nicely, and gives the pen its classic vintagey look. Clearly, the folks at Retro 51 thought this one through. 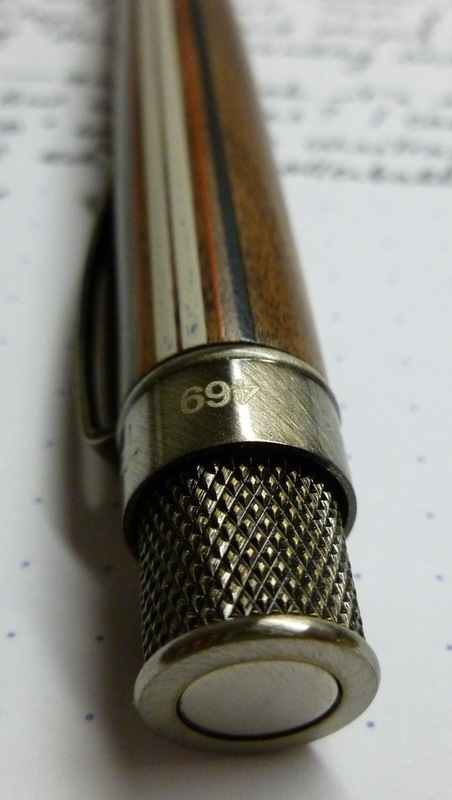 The edition number is printed or etched (I don’t think it’s engraved) on the band at the twist end of the pen, and I received #469 out of 500. Limited editions of affordable pens always tug at me. Though I have been known to resist some similar offerings in the past, I couldn’t do so with this one. It was just too irresistible in pictures and is even more so in hand. The Retro 51 Vintage Surf Tornado is even cooler than Greg was in that Brady Bunch episode, and MUCH cooler than Don Ho and his ukelele serenading the Brady family at their obligatory luau. It’s so cool, it’s hot.